The Tri-Fold Carbon Cork Trekking Poles have been designed to provide several important benefits- comfort, durability, convenience. They are both customizable and convenient as their height is adjustable using a single flick-lock and they can be collapsed down to less than 15 inches for easy storage or transportation. Additionally, the poles are made of materials designed to provide both comfort and durability. The Tri-Fold Carbon Cork Trekking Poles feature carbon fiber shafts and aluminum alloy connectors. Single-flick lock allows the poles to be easily adjusted to heights between 115cm to 135 cm. The poles be folded up (at which point they are less than 15 inches long) for storage or transport. Handle is made of syncork which is both comfortable and sweat absorbing. The handle is ergonomically shaped. The poles weigh less than 9 ounces. 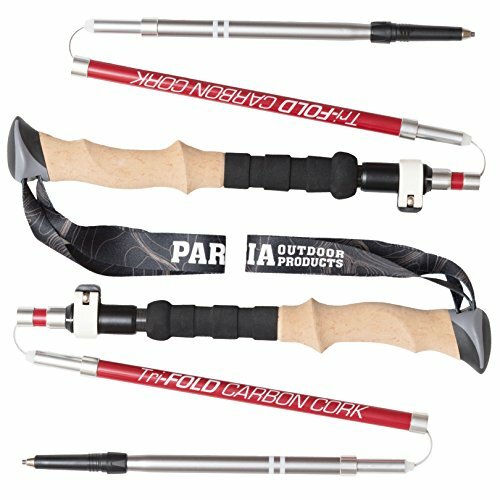 Paria Outdoor Products offers a limited lifetime warranty on the Tri-Fold Carbon Cork Trekking Poles. Included accessories are an individual storage bag, a hiking basket (to be used to keep the tip from sliding into soft mud or snow), and a rubber tip (to be used on paved surfaces to protect the carbon tip). The vast majority of consumers who have tried the Tri-Fold Carbon Cork Trekking Poles from Paria Outdoor Products gave them a 5-star review, citing the comfortable syncork grips and the ease and convenience of both adjusting and collapsing the poles. Many users also commented on the great customer service offered by Paria. Almost every negative review was quickly addressed by customer service with an offer to try to right the situation. Additionally, the company redesigned the poles to strengthen the locking system in response to a complaint they had received from customers. Lastly, customers greatly appreciated the great value of these poles, coming in at around 1/4 the cost of some well-known brand-name poles, while still providing a quality product. The materials of the poles (carbon fiber, 7000-series aluminum, and syncork) are very durable. In fact, syncork is both more durable and more environmentally friendly than real cork, without sacrificing any of the benefits of real cork. The carbon fiber of the pole shafts provides good shock absorption (though there are not specific shock absorbers on the poles). Adjustability of the poles means that they can be customized based on height as well as terrain or activity. These poles could even be shared given their easy height adjustability. The collapsed length of the poles (less than 15 in.) is ideal for fitting the poles in a bag, such as a backpack while hiking or a suitcase while traveling. The collapsed poles will allow users to avoid the frequent annoyance of their poles sticking out of a bag where they could get caught on something as well as the inconvenience of taking a large set of poles through an airport. Reassembly of the collapsed poles is simple and takes no more than a few seconds. The light weight of the poles minimizes arm fatigue during use as well as allows the poles to be more easily transported. The limited lifetime warranty allows consumers to feel secure in the purchase. These poles come with only two key accessories, avoiding the often unnecessary confusion of selecting a tip that consumers may experience with other poles. Paria offers strong customer service—they are responsive to customer concerns and complaints and are willing to send replacements to unsatisfied customers. The price point of these trekking poles is significantly more affordable than more well-known brand name options. Though there are many compelling reasons to choose to purchase the Tri-Fold Carbon Cork Trekking Poles and many consumers have voiced satisfaction with their purchase, there are several shortcomings that must be considered when reviewing these poles. The connecting cable inside the external tube is reinforced with glue rather than welded, which can lead to the connector coming unglued and the poles collapsing. If this were to happen during use, it could cause a potential safety hazard. The straps on the poles are thin, meaning that they may wear easily. Additionally, some users have reported incidents of irritation from the fabric of the straps. ►NEW AND IMPROVED FOR MARCH 2017 - Newly simplified locking mechanism, super-strong carbon fiber shafts and aluminum alloy connectors create an incredibly durable package. They will not let you down! ►ADJUSTABLE - The poles are quickly adjusted from 115 cm to 135 cm using a single flick-lock, allowing them to always be at the ideal length for whatever terrain you're on. ►COMPACT - The unique folding design packs down to less than 15 inches in length, making our poles easy to fit into a carry-on or small backpack. Assembly is simple and takes just a few seconds. ►COMFORTABLE - The ergonomic syncork handle will absorb sweat and provide all-day comfort for both men and women. Each trekking pole comes in at less than 9 ounces, reducing arm fatigue and letting you get farther on the trail.